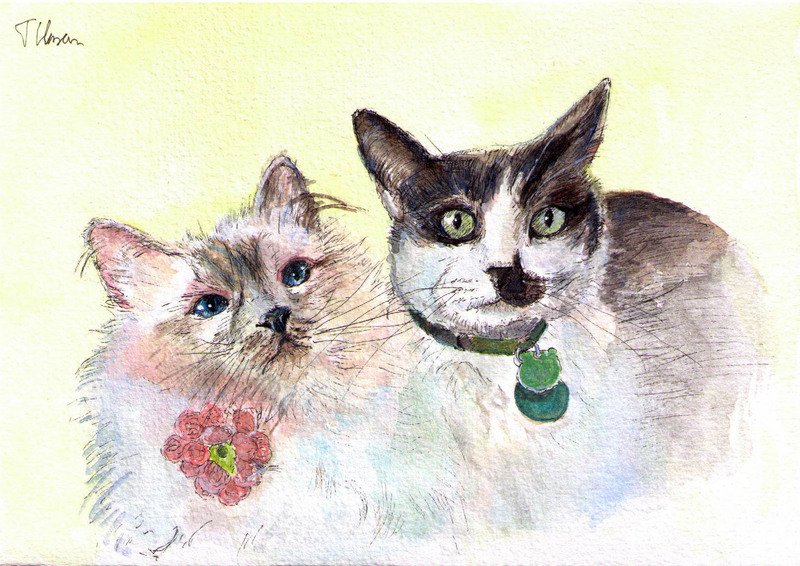 This is a double cat portrait that I’ve recently been commissioned to do by someone who intends to offer it as a gift. The cat to the left is Allie and the one to the right is Mauricio, and I’m told that they’re a couple! I did this portrait using two photos of each cat and merging them together. I first did a light sketch of the shapes in pencil, and then drew the details in ink pen. After that, I added watercolor. This piece is on A5 sized watercolor-paper. The client mentioned that it was important that the pink knitted flower worn by Allie the cat was included because, supposedly, this was a gift offered by the gentleman(cat) beside her. In including this element, I also sought to bring out some of the red tones in Allie’s fur. Mauricio has green eyes, and his collar and tags match them in color, which is also something I tried to bring out. I also took care in having the bright blue tones of Allie’s eyes reflect lightly in Mauricio’s fur, the goal being to keep the image harmonic. Tagged Ballpoint pen, Cat, commission, Drawing, Featured, group, painting, WatercolorBookmark the permalink. Lovely portrait and great use of colour to create harmony and cohesion. Thank you very much, Pam and Sammy!